This website acts like a typical drugstore that you could find anywhere else, but the beauty lies in its convenience. Of course, you could go and purchase these items, especially if you live in the US, as long as you can drive out and go to your nearest supermarket. But with this, you can expect products to be delivered straight to you. You can sign up easily and go through their huge inventory of nearly 30,000 items for both health and wellness. They also guarantee that you can get up to 50% of savings on your usual prices. They have a wide selection of skin care, hygiene and baby products that is quite a sight to behold. While Medshop does not actually sell any prescription medications, they do have some over the counter vitamins, supplements, first aid, and sexual health products for those looking for them. Coupons are a good way to save money both in real stores and online ones. A lot of offers are often in the form of promo codes, especially online stores that will declare a certain discount amount for an order or for signing up, or they’ll give you a lower price for a certain product. The ones displayed below were found at https://www.offers.com/medshop-express/, and there are plenty of them to go around. However, codes and promos have to be used before they expire, at which time they can no longer be used. Medshop Express has a lot of deals for its customers. For one thing, you can expect your items to be shipped for free if you buy a total of $75 and up and you’re living in the US. International shipping rates are guaranteed to be affordable and also fast so they can get to you quickly. They’ve got a page that gives you daily deals with a list of all products that have been marked down for the day. They’ve even got a loyalty and rewards program for members. To become a member, you just need to register, which will only take less than a minute and doesn’t cost a thing. For more information on their rewards policies, you can visit https://www.medshopexpress.com/partners/rewards-rules. Reviews are the lifeblood of many different establishments, whether they be new stores or old businesses. Many people rely on reviews to help them decide whether to favor one product or another, or whether to visit an establishment or not. Medshop has a great number of reviews that have been posted up on its website. 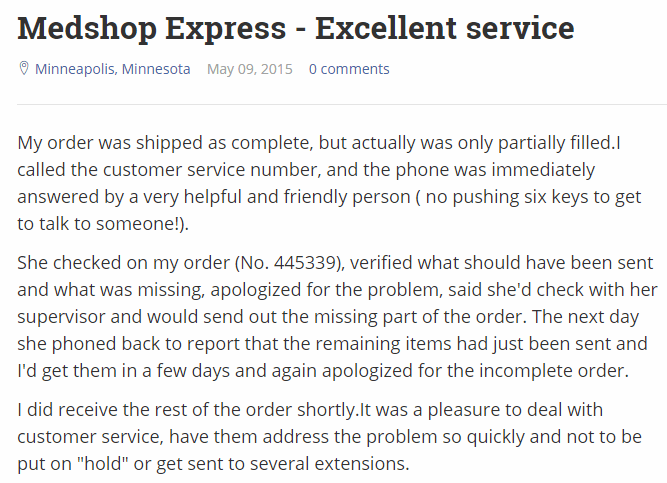 Almost all of them are positive and express how the website was prompt and timely in the way they delivered products. They also declare that the service is courteous and accommodating to questions. They have nearly 200 positive reviews written for their service on site. However, this does not seem to be the case when you check outside of the website. It is quite easy these days to accuse a business of faking reviews, especially if these are found on site, so people turn to reviews done outside the website. 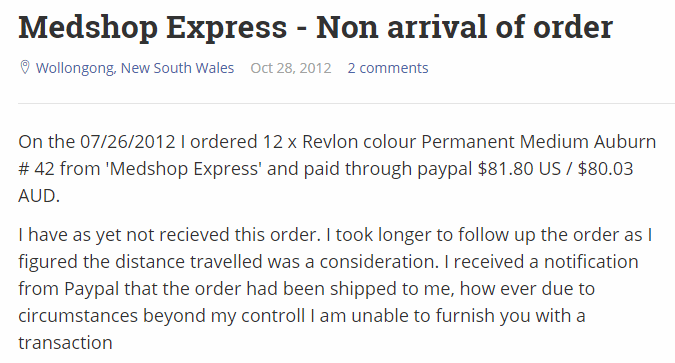 At pissedconsumer.com, we found the above review from a customer who had not received their order and it was even stated on their PayPal account, which they had used to pay the store that it had supposedly already arrived. There are quite a few more that expressed distaste over the website, but while they exist, they number only a handful of complaints that span over several years. Other customers have expressed satisfaction even after a mix up in the order or a partially completed shipment because they were given assistance by the store. Some people have said that the customer service given was excellent, while others said they did not help at all. Regardless, the website has been able to stand for more than a decade now, so if you do want to give the store the benefit of the doubt, it is up to you. While there is a store called Medshop Express, there is another one called Medshop as well. However, the second website, found at this link (https://www.medshop.com.au/) is an online store that sells medical supplies and equipment from Australia, such as stethoscopes, surgical instruments, wheelchairs, scrubs, and more. If this is not what you are looking for, then you check the other website instead. Still, it can be easy to mix up two different websites and stores, as the internet today is saturated with websites that are bound to have similar or the same name. Medshop Express is an online store that caters to customers who want to buy health products at lower prices without the hassle of going to an actual store. They have a wide variety of products put on display, from hygiene-related items like soaps and shampoos, to over the counter medicine like lozenges and Tylenol, to other products like deodorants, vitamins, and baby powder. They offer a number of benefits to consumers, such as free shipping for $75 purchases, and a rewards system for members that is easy to join. The website seems to have a few bad reviews from independent review sites, though it has excellent reviews on its own website. This may warrant customers to ask others who have already tried the services if it is a safe investment or not. However, if you are looking for an online pharmacy where you can get prescription medications safely and for a low cost, then you should check the list of online pharmacies we are recommending to our readers here.